- hanging as line laundry. And a short movie, in MPEG-4 video format (4.5 MB) or Quicktime MOV format (1.3 MB). The pattern is based on Kitemonger's Spinsock Pattern. When I made the panels I pieced them together from fabric cut across the end of the 5' roll, not along the length. 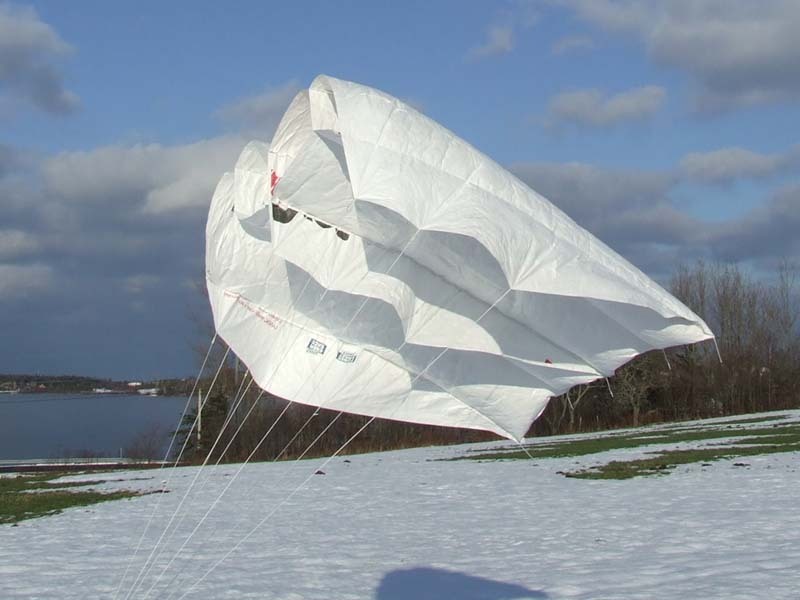 Kite #3 - A 1.8 m wide two-line foil, designed by David Holt. July 11, 2009: new photos and stuff. March 25, 2009: Just finished sewing and backyard-testing a prototype of a rotor, which I call the X-Squared Rotor. As far as I can tell it's an original design, at least in terms of how the template is made. August 8, 2009 update: first flight with the tube tails. April 18, 2009: Kite #5 - Sunshine, snow is gone, some light wind, and the ground is thawed enough to put a stake in the ground. Woohoo! 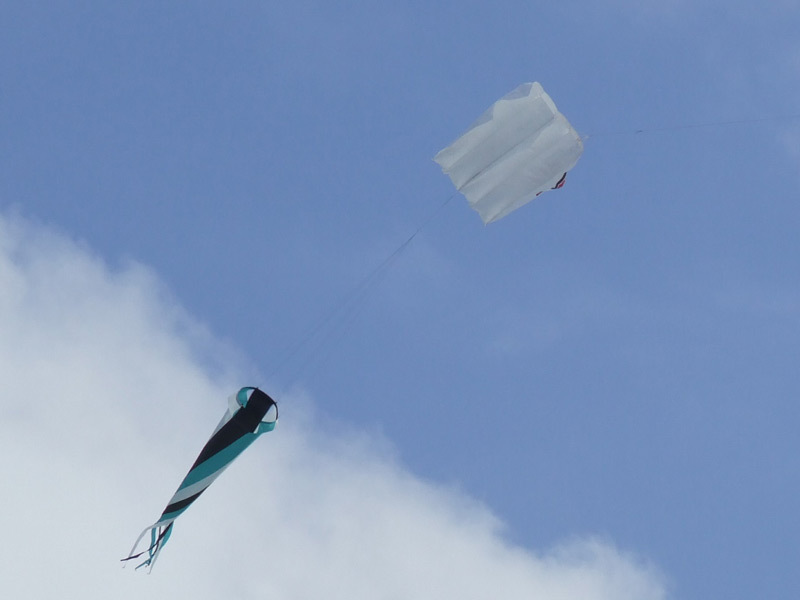 Test flight of my One-Piece Cody box kite. 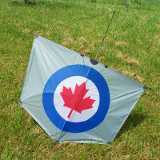 Kite # 6 - This was built during the Dieppe 2009 International Kite Festival, at a workshop given by Karl Longbottom. As near as I can determine, it was the last kite out of the sky on the last day of the Festival, just before the wrap-up banquet. 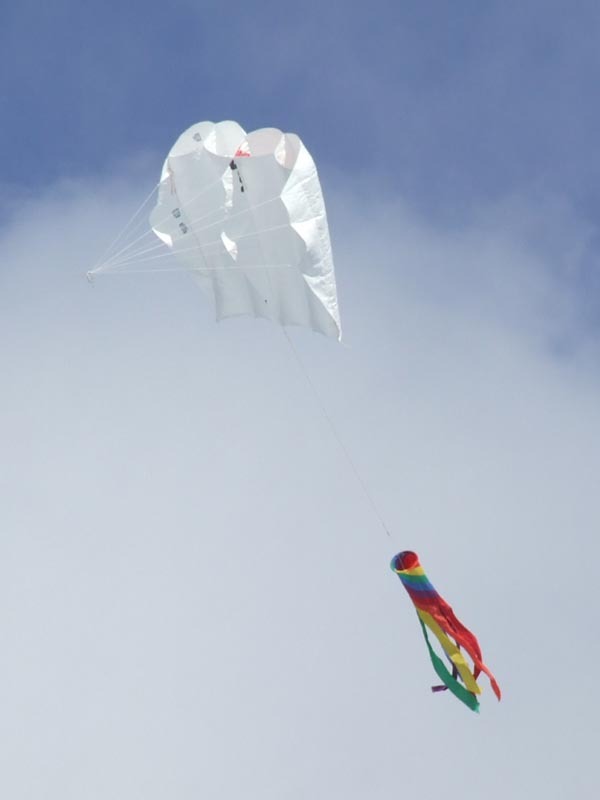 It is an excellent flier, although the lines connecting the top to the lower wingtips may need more careful adjustment in stronger winds. Umbrella Rotor - built from the skin of a broken golf umbrella. 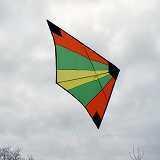 Kite # 9. This is my lowest-wind kite yet. Kite #10 Kite #11, April 22, 2010. May-June: #12, #13, and #14. 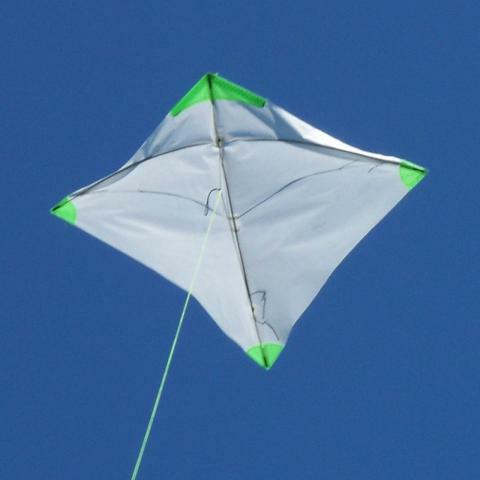 Kite #15. Aug. 28 - the tails are done. Deep Pocket Sled September 2, 2010. 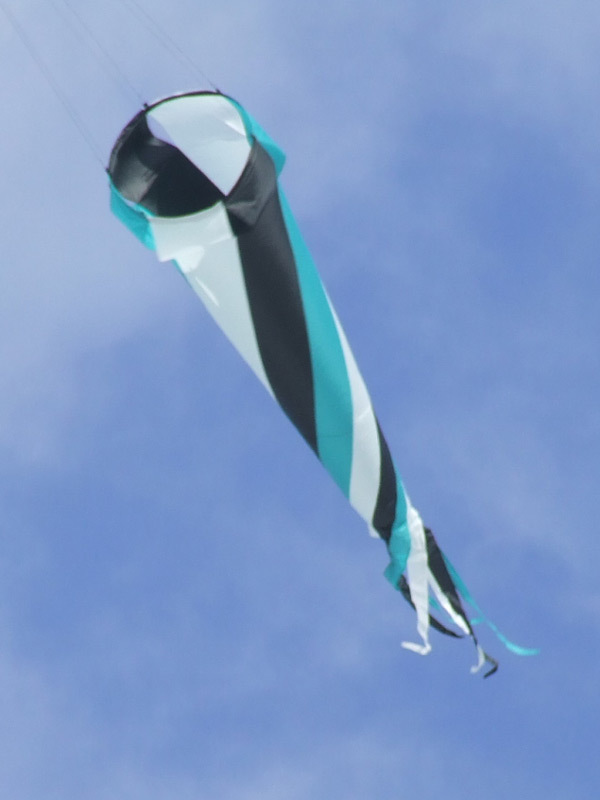 Kite #16, an unsuccessful experimental kite design. 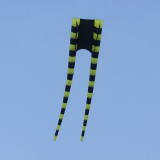 Kite #17, Great for low-wind/no-wind conditions. 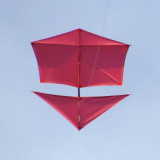 Kite #20 - scaled down to about 2/3 of the width of the original plan. It's still unstable, and I have to fiddle some more with the frame and fittings. August 31, 2011. 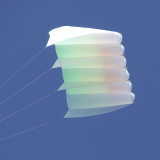 Kite #23 - an Ohashi/Poster kite, built to be donated to a fund raiser auction. 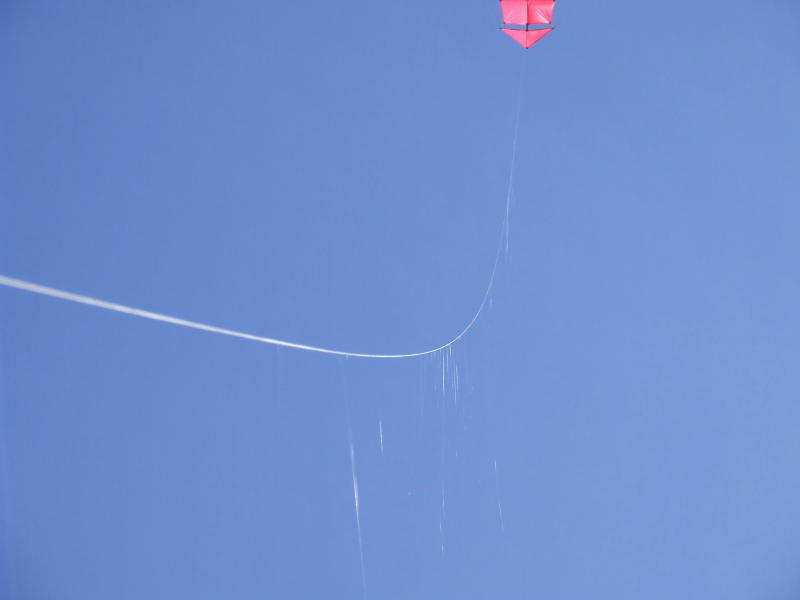 (page under construction) A resonator device to amplify the sound of the wind in a kite line. Nov. 15, 2009 - An idea for a DIY fitting: bowed spreader bar to leading edge spar. May 18, 2010 - Woohoo! A new (to me) sewing machine with a table. May 21, 2010 - It was too nice out (sunny, wind NE 8-15 km/h) to continue mowing the lawn so I took the Pearson Roller and the newer pocket sleds to a field along Folkins Drive, mostly so I could photograph the pocket sleds. Just before I started packing up to leave I noticed these spider silk strands on the flying line for the Roller. 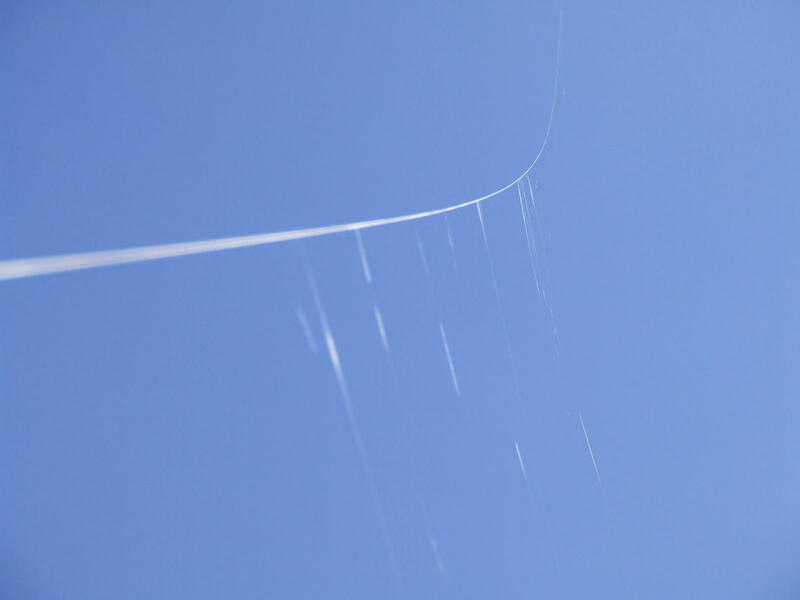 These would be from small spiders that were travelling by ballooning. 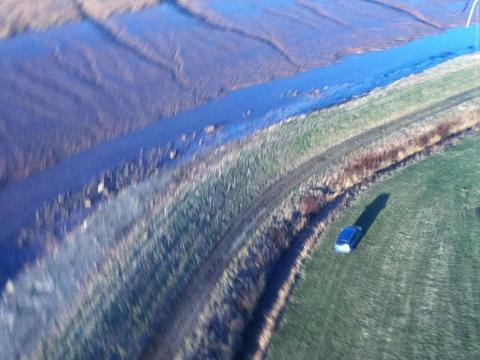 I had maybe about 200 feet of line out. There were dozens of them, many at least 20 feet long or so. They were a bit tricky to photograph, because the best viewing angle was almost directly into the sun. iKap - versions 1 and 2, My quick-and-dirty KAP rig for an iPod touch on a Pearson Roller.